Traffic congestion, mounting road tolls and ever-increasing petrol prices are driving demand for apartments close to ferry wharfs, railway stations and bus routes – and developers are responding. The latest is Meadow Bay at Meadowbank, which combines comfort with the convenience of being just short walk from ferry, train and bus services. NSW Planning Minister, Pru Goward, is trying to achieve with her proposed changes to apartment design standards. By eliminating the need to provide parking on site Ms Goward hopes to encourage developers to build near public transport hubs. While Meadow Bay offers secure underground parking for residents, locations where you don’t need a car are in high demand. Harj Uppal, Managing Director of Regency Real Estate said people are frustrated at being stuck in traffic and having to pay the spiralling costs of petrol and road tolls. “At Meadow Bay you can get to the city by train in 20 minutes and to Parramatta in half that time. “A bonus is that today’s technology enables you to be productive when travelling to and from work on public transport, if you wish," he said. Auslon Property Group, confirmed that proximity to public transport and existing infrastructure was an important factor in determining where to develop. Steven Yu Managing Director of Auslon Property Group said Meadow Bay ticks all the boxes. 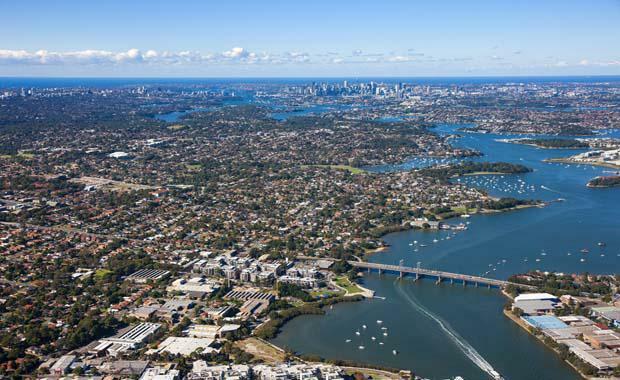 "The location is close to several shopping centres, excellent schools, parklands and, of course, it is near the foreshore of Sydney Harbour," he said. FORM architects , Meadow Bay follows the contours of a rock-faced escarpment formed in the construction of an underpass in the late 19th Century. Ron Edgar, architect at FORM said each unit has its own unique aspect. “The rounded corners of the building and the materials selected for the external finishes are intended to evoke the industrial and technological history of Meadowbank in the 19th and 20th Centuries,” he said. Meadow Bay apartments range from 50 square metres to 114 square metres and will cost between $499,000 - $1.5 million. Construction of ‘Meadow Bay’ will start early in 2015 and should complete around mid-2016.